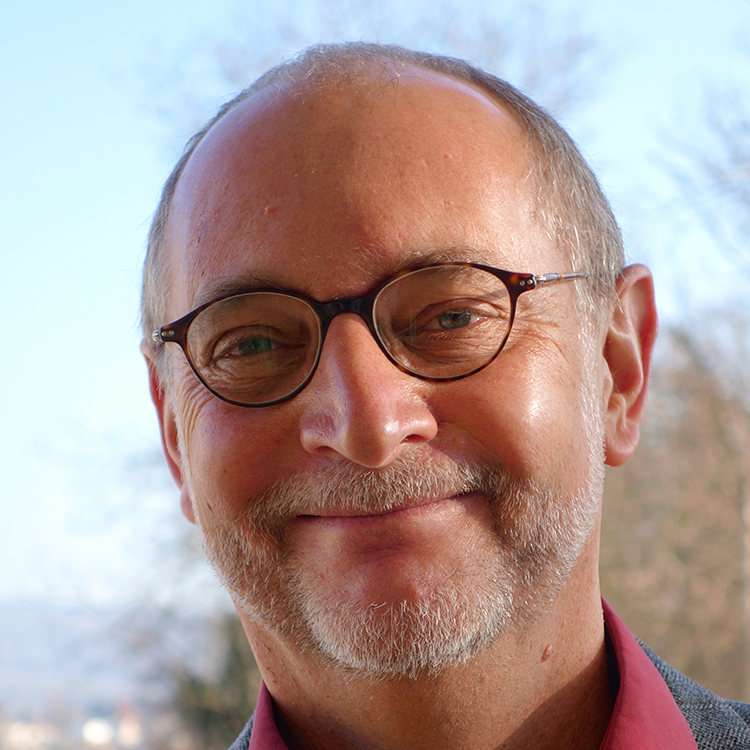 Joseph Martignoni. Three paddle-steamers near Rorschach on Lake Constance. 1850. View over Zurich from the Weid. Aquatint, partly etched, two-tone print (black/blue). Artist and engraver: Heinrich Siegfried. Publisher: Rudolf Dikenmann. Between 1856 and 1877. 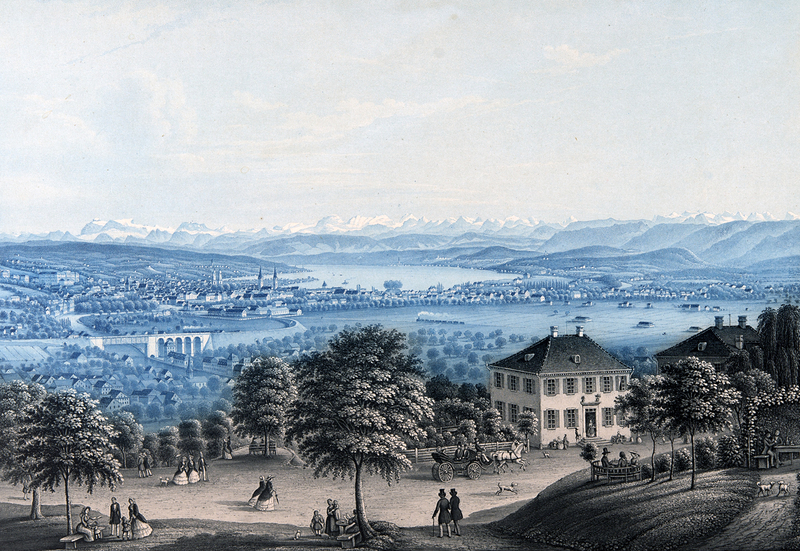 The two steam trains on the route from Zurich to Baden, opened in 1847, and on the route from Zurich to Romanshorn via Winterthur, which came into operation in 1856, are the two main events in this representative image. The same view had already been published by Dikenmann and others before the construction of the curved railway embankment and the viaduct. Now, artist Heinrich Siegfried had placed the new civil engineering structures of the railway line in the picture as visual attractions. The staffage figures in the foreground still have a Biedermeier effect, but it is the potential for growth between Biedermeier and the Wilhelmine period that is striking, both at the time, and from today’s perspective. 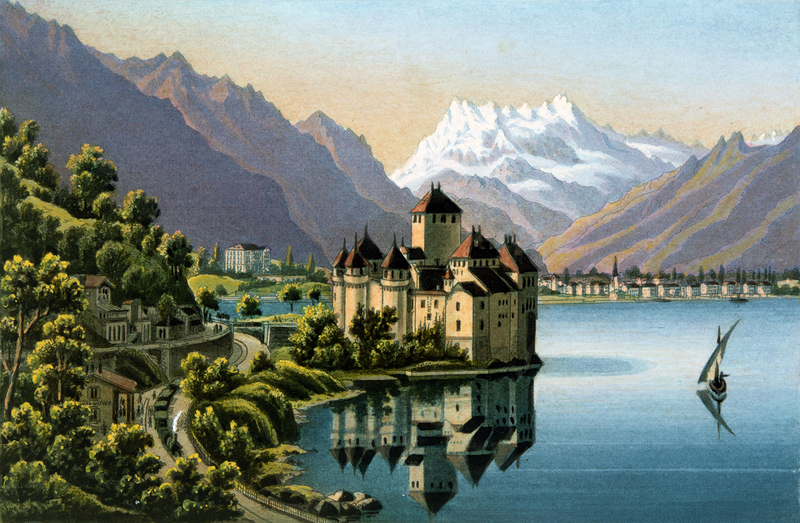 The Zurich art publishing company of Rudolf Dikenmann (1793-1884) and his son Johann Rudolf Dikenmann (1832-1888) shaped the image of Switzerland in the time of Gottfried Keller simply because of the sheer volume of the views produced in the Dikenmann studio. The ‘engravings’ were produced from sketched originals, using the aquatint technique. They came on to the market in their thousands: in petit or folio format, as vignettes on notepaper, as a simple black print or as a two-tone print in blue/black. Some of the high-quality typographic prints were coloured by hand by Dikenmann’s daughters Anna and Louise, and by his younger brother Johannes. Rudolf Dikenmann, who had worked for Peter Birmann in Basel after completing his apprenticeship with Orell Füssli & Co. in Zurich, still had all the ‘Kleinmeister’ (‘Little Masters’ school of engravers) expertise, even though the Kleinmeister era was over. The Dikenmann art publishing house was the last manufactory and family business of its kind. The photochromic printing process developed in Zurich, and used at Orell Füssli from 1888, was already presaged in the rich colours, evocative of enamel painting, of the later prints. View over Lake Geneva. Aquatint, hand-coloured two-tone print. Watercolour sketch by Rudolf Dikenmann. Aquatint, two-tone print. Aquatint, hand-coloured two-tone print. By coincidence, from 1852 Dikenmann’s studio and business premises were located at Rindermarkt 14, in close proximity to the house Zur Sichel at Rindermarkt 9 in which Gottfried Keller (1819-1890) spent nearly 30 years of his life. In his partially autobiographical novel Green Henry (Der grüne Heinrich), in the chapter ‘The Beginning of Work’, Keller sketches a vivid picture of the mass production of souvenir pictures with the aid of young colourists. Keller, who himself spent a year as an apprentice to a ‘painter of art’ without learning anything, harboured a marked aversion to the work of the ‘colourists’ and to ‘tourist pieces’. The description of the ‘fantastical nightmares of art’ in the studio of the fictitious master Habersaat in Green Henry may be a caricature, but it gives a glimpse into the layout and the work processes in such a manufactory operation. 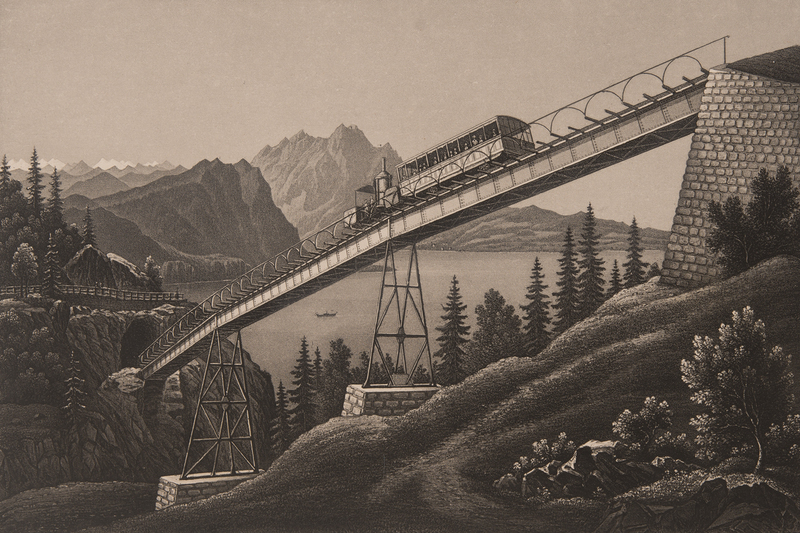 One of the most-visited destinations in Switzerland in the Wilhelmine period was the Rigi, with its Rigibahn, opened in 1871 as Europe’s first mountain railway. The journey over the Schnurtobel bridge in the rack railway train, described by Mark Twain in 1878 in his travel memoire A tramp abroad, must have been a heart-stopping experience: ‘We got front seats, and while the train moved along about fifty yards on level ground, I was not the least frightened; but now it started abruptly downstairs, and I caught my breath. And I, like my neighbors, unconsciously held back all I could, and threw my weight to the rear, but, of course, that did no particular good. (…). By the time one reaches Kaltbad, he has acquired confidence in the railway, and he now ceases to try to ease the locomotive by holding back. (…). There is nothing to interrupt the view or the breeze; it is like inspecting the world on the wing. However – to be exact – there is one place where the serenity lapses for a while; this is while one is crossing the Schnurrtobel Bridge, a frail structure (…). 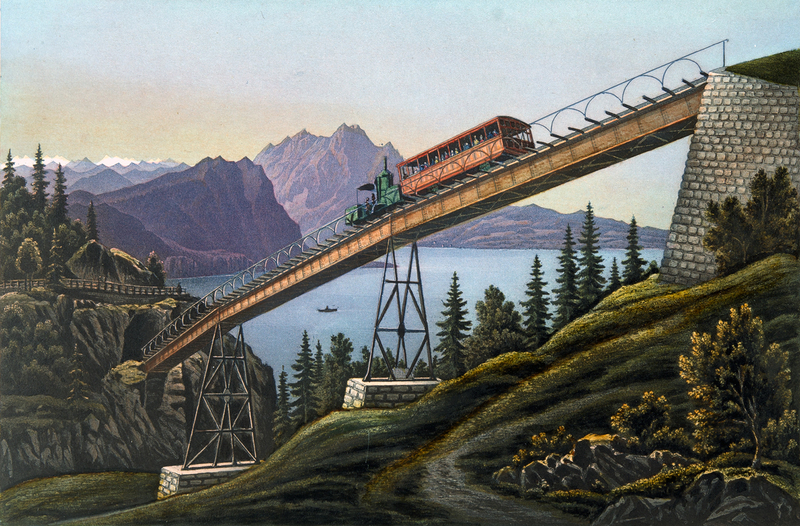 One has no difficulty in remembering his sins while the train is creeping down this bridge.” It is no wonder that the locomotive, with its vertical boiler and open passenger carriages, crawling down the Schnurtobel bridge became a popular subject for souvenir pictures. Rudolf Dikenmann sketched the scene in around 1880, as a template for its production as an aquatint. The Rigi Railway on the Schnurtobel bridge. 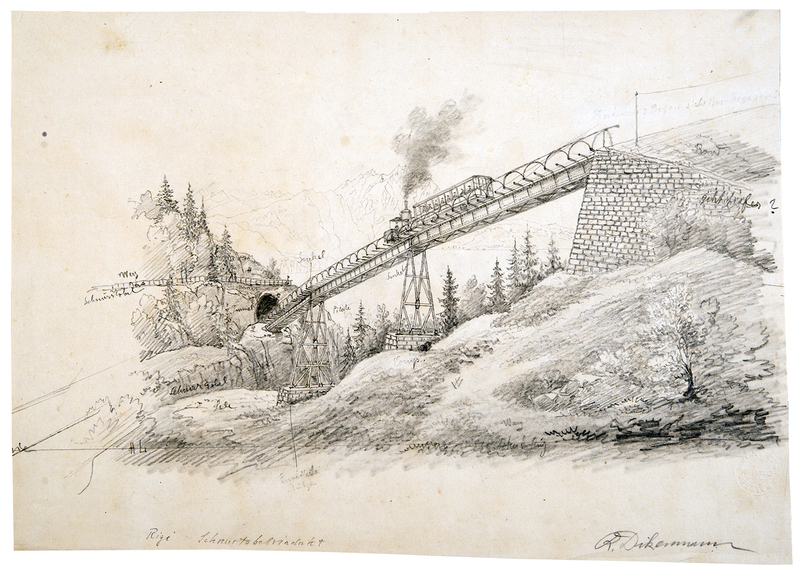 Sketch by Rudolf Dikenmann. Aquatint, black print. Aquatint, hand-coloured two-tone print. 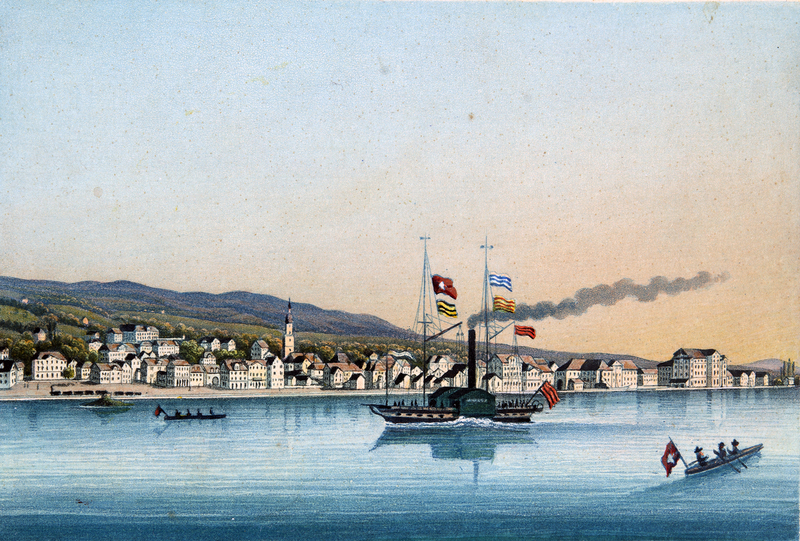 One particularly attractive print from the estate of the Dikenman Kunstverlag depicts three paddle-steamers on Lake Constance. The artist is Rorschach landscape painter and publishing associate Joseph Martignoni. 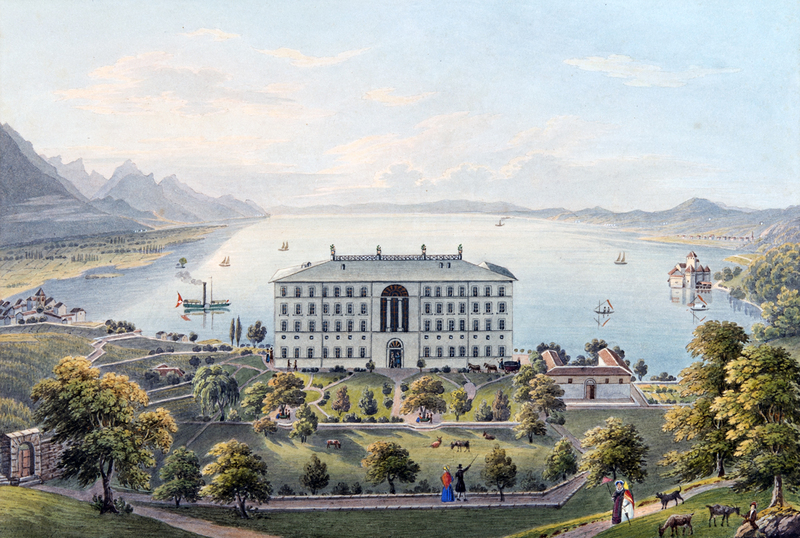 The 1850 drawing, painted in watercolours, served as an engraver’s template. 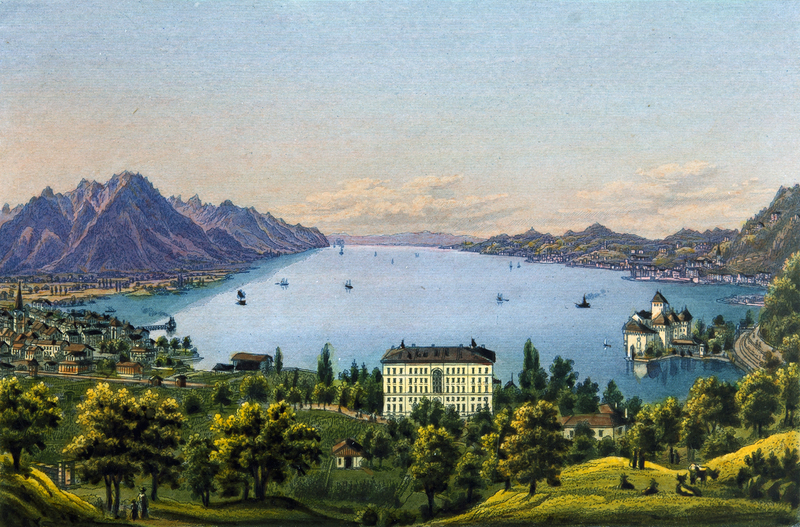 On the left of the picture is the Stadt Schaffhausen, the first Swiss steamship on Lane Constance, and in the centre is the flush-deck paddle steamer Kronprinz, which was brought into service in 1838. 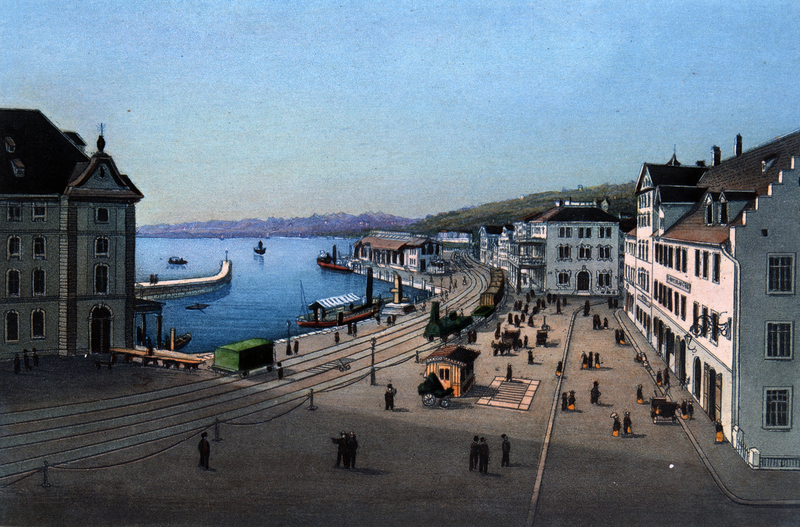 The Kronprinz was Württemberg’s second Lake Constance steamer, and the first Lake Constance vessel built by Escher Wyss in Zurich. 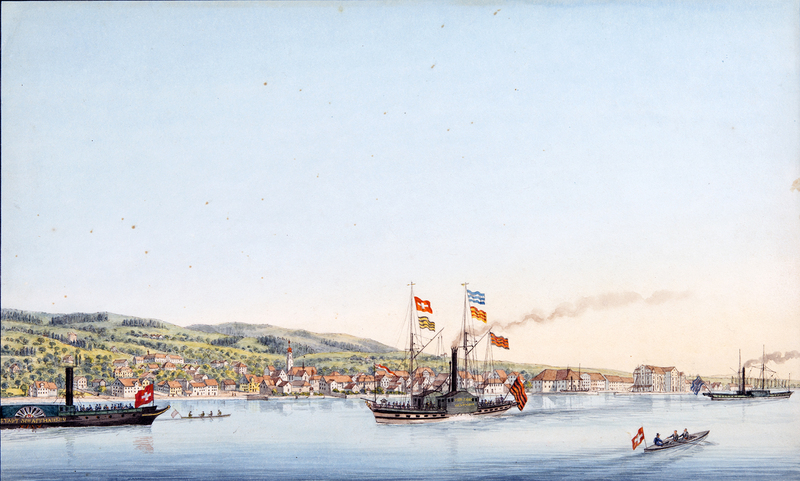 The vessel on the right of the picture is probably the Baden ship Stadt Constanz, although it is shown flying Bavarian colours. 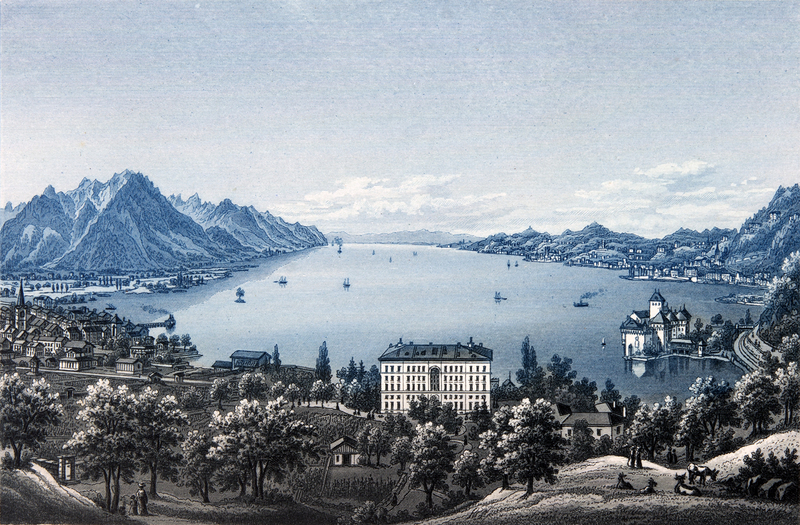 In Rorschach the lines of the United Swiss Railways from St. Gallen and Chur, opened in 1856 and 1858 respectively, connected with shipping traffic to Germany. At Rorschach on Lake Constance. Watercolour sketch. Aquatint, hand-coloured two-tone print. Aquatint, hand-coloured two-tone print.